For many businesses, summer means higher energy costs. 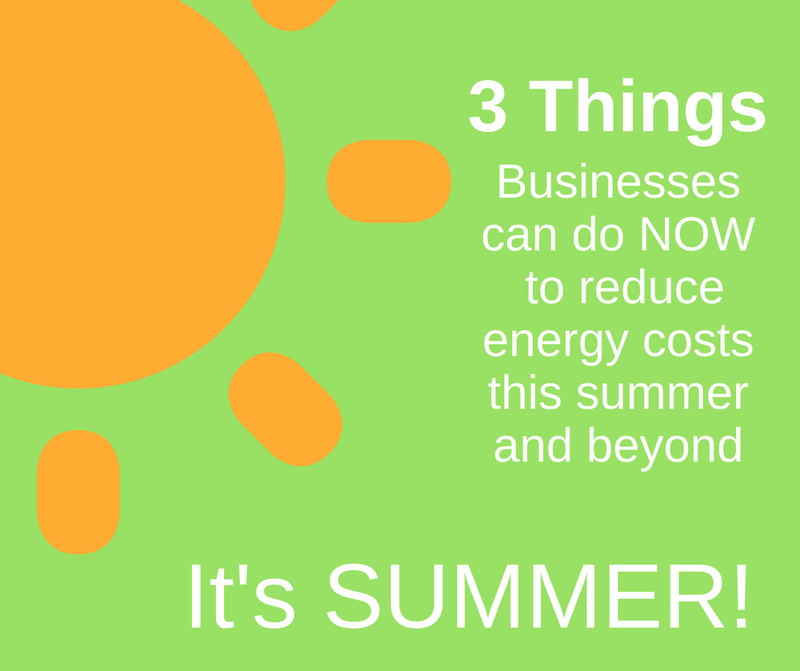 Here are 3 simple things you can do NOW to save money and be more energy efficient this summer… and three more tips to get you ready for next summer. Invest in a daylight responsive lighting system: According to a 2014 study, owners and tenants could save $70 million every year with these systems. Shield the sun: While you should try working by daylight whenever possible, remember to shield your office from direct sunlight by closing shades in windows facing the sun. This will keep your office cooler and may allow you to lower air conditioning costs. Pay attention to your environment: Increase the filtering properties of the glass in your building by installing solar shades or applying window films to existing glass walls, windows and doors to reduce heat (and glare). This will allow you to keep the office cool with less energy and help ease loads during expensive peak hours. Consider a cool roof, which is designed to reflect more sunlight and absorb less heat. Do you know what the estimated temperature difference is between a cool roof and a standard roof? Click here to get the answer. You can also plant tress or plan your landscape to provide even more shade. Green roofs or rooftop gardens help absorb heat and act as insulators for the building. They also help with stormwater runoff in urban environments that might otherwise result in damaging floods. Summer hours, casual Fridays: If your business allows it, reducing the number of work hours in summer may enable you to shut down and switch off in more ways than one. Some companies offer employees Fridays or alternate Fridays off, or half-day Fridays. Even if all your employees need to be in the office, having casual Fridays, when suits can be left at home, may allow your business to lower the air conditioning bills. Change your lighting: You can save up to 80% of your lighting costs by replacing your traditional incandescents with compact fluorescent lamps (CFLs) and light emitting diodes (LEDs). CFLs cost about 75% less to operate, and last about 10 times longer. LED lights use about 85 % less energy compared to standard incandescent bulbs. In addition, Only 10% of the energy from traditional bulbs is used for light — the rest is wasted as heat. By using CFLs and LEDs that give off less heat, you can reduce your need for air conditioning and save money.